Likewise suitable for doing excerise such as, yoga, running or dancing and so on . IMPROVED SIZE: Our size is NOT US SIZE. DO NOT use Amazon size chart. 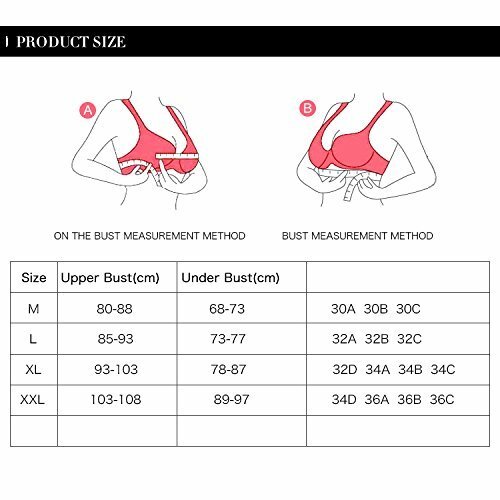 Please refer to our Size Chart on Product Description before you place order. this bra made of 80% Nylon, 10% Polyester, 10% Spandex The Ladies High-support Bra Top Is Perfect For Training Sessions Down At The Gym, Constructed With A Built In Bra For Added Support Along With Ventilation Panels And Wide Shoulder Straps For A Cool And Comfortable Fit. This Sports Bra Also Benefits From An Elasticated Hem, Finished Off With Reflective Detail To The Racer Back Sport Bras. Soft, Stretchy, And Super Breathable,This Is An Awesome Saturday Bra. Tough Enough To Handle Hot Class, Then Slips Seamlessly Under Your Favorite Tank Or T-Shirt For Whatever Else You Want To Get Into That Day. Built For High /Medium-Impact Activity And All-Day Comfort.